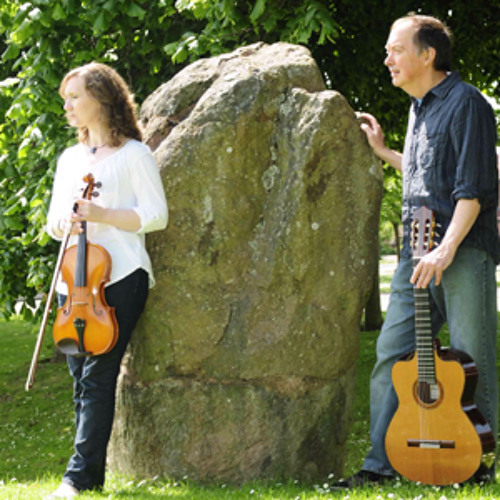 Stone Stories - Viola and Guitar Duo Composer John Gourlay 1 Prelude 2 Fossil Tree, Crail 0.45 3 Interlude I 3.13 4 The Bunnet Stane, Gateside 3.54 5 Interlude II 6.52 6 Balfarg Henge 7.29 7 Interlude III 10.53 8 Wemyss Caves 11.34 9 Interlude IV 13.46 10 Inchcolm 14.28 11 Postlude 16.42 This piece was written for the Viola / Guitar duo April Randall and Stephen Morrison. It was premiered at the Edinburgh Fringe 2013 in St Andrew and St George's, George Street. This live recording was made at St Andrew and St George's Church Edinburgh. Further performances have been given in St Andrews, Dundee and Kirkcaldy. A prelude and postlude begin and end the visits to these five stone places, each separated by an interlude. On the shore at Crail a once growing, living tree is frozen for all time, lapped by the tide, and near Gateside a hundred centuries of erosion by wind, frost and rain have left a rock in the shape of a hat. At Balfarg in north Glenrothes is a place of bone and fire, a place of cleansing and final rest and at East Wemyss all the ages have left their marks in the darkness. With all that sky Inchcolm must be nearer heaven, but it is still a hard journey to paradise.